Prep in 15 minutes, chill for an hour. In a food processor, combine avocados, maple syrup, almond milk, vanilla, cinnamon, salt, and lastly, the melted chocolate. Puree until creamy. Spoon mousse into adorable jars and chill for at least 1 hour. Literally no one who eats this can tell it’s vegan or that it’s made with avocados unless you’re lazy and let a little green lump survive the food processor. I strongly discourage trying to switch the wash or doing high-production flat lay photography while making this because the melted chocolate will start to solidify and you can't microwave a food processor. 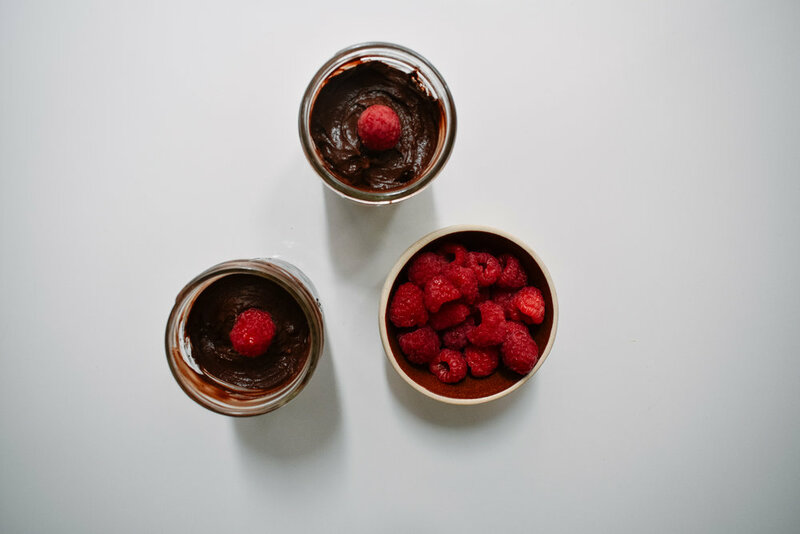 Dark chocolate and raspberries are my absolute favorite dessert combination. I like it with loads of raspberries but restrained myself for the sake of being able to see the mousse in the photo. Homemade whipped cream makes this non-vegan but very delicious.